Can anyone help me decipher the Mei found upon a Japanese Naval Officer's Kyu-gunto? It has different characters on each side along the tang found under the sharkskin grip. The blade is extremely sharp! 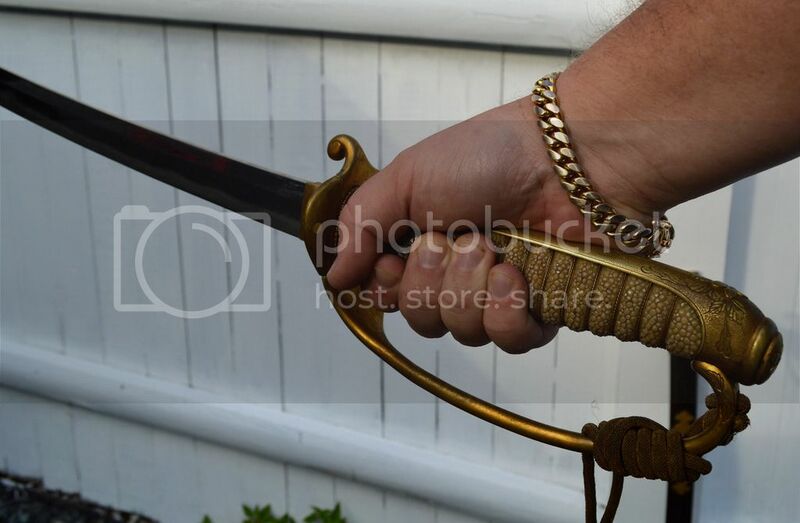 I'm no good with Asian lettering, however the sword is pretty incredible and I'd love to know if it is dated, maker signed, & where it was made. 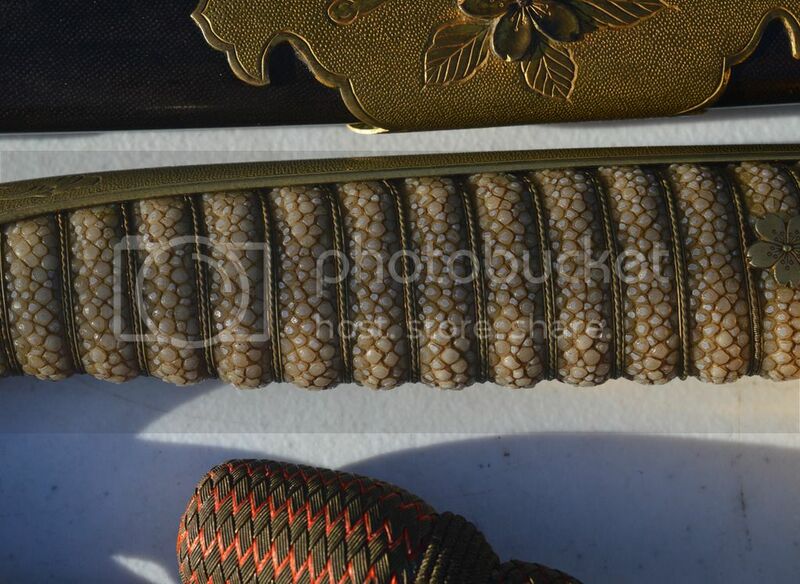 Has an incredibly intricate sword tassel & ball knot that is orange/red & olive green. The hilt backstrap even has a natural Ruby & Blue Sapphire. One pin holds blade in place. Blade registers 99.99% steel on XRT Spectrometer and definitely was hand forged. Thank You Guido Schiller... Is there a Date / Province in the characters / or reciepient's name perhaps? Is there a Date / Province in the characters / or reciepient's name perhaps? I'm not 100% sure about the year: since 四 (4) is considered an unlucky number, it sometimes was written 二二 (2 + 2), which might be the case here. The province is 備州 Bishū (備前 Bizen), the town is 長船 Osafune, the smith 祐定 Sukesada, and 作 saku means "made by". Take care of the blade, and nothing abrasive to clean it! Just oil it occasionally. Nice complete package, would like to see the back strap inlay ruby. (op) Thanks guys for all your help... I am amazed at your knowledge and passion for edged weapons... I will add many more photos if it is okay to do so. I did not want to overstep my newbie status! On another board a member said the blade was extremely old, like 16th century old! The multiple holes along the tang show it has been repurposed several times, correct? The fancy tassle & knot (albeit can be swapped from sword to sword) tells that if these two aren't a marriage the officer must have been high ranking, correct? Yes to both questions, Id think its org but could have been added, id vote not. May be post pix in Military section. The knot and sword belonges together. There was no knot rank system on the navy kyugunto. The green is tarnished silver. Collect IJN/SNLF swords, dirks, headgear and Nihon-to. "JUST AS THE CHERRY BLOSSOM FADES AND FALLS TO THE GROUND, SO IT IS WITH MY USEFUL LIFE. SHOULD IT PROVE TO BE OF USE TO MY EMPEROR I WOULD NOT FAIL TO FALL"